With the upcoming Summer Olympic Games in Rio de Janeiro, the Parkes Library history blog will focus on Olympians from the Parkes Shire. Each post will provide a snapshot of the sportsmen and sportswomen who have worn the green and gold and called the Parkes Shire home at some point of their lives. The 1950s were a golden era for sports stars from the Parkes Shire, with two representatives in athletics at the 1956 Melbourne Olympics. 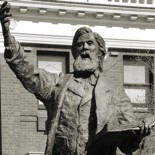 This post will be a snapshot of Edward “Ted” McGlynn, who was a sprinter. 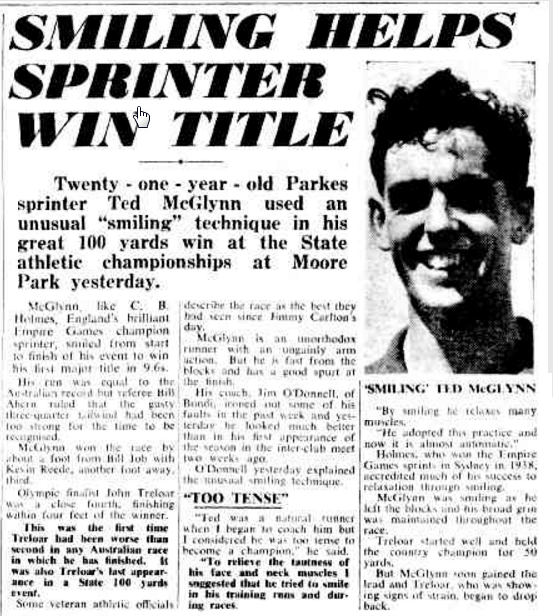 Melbourne Olympian Ted McGlynn was best known for the smile on his face when he sprinted down the straight. And it all came from a tip given by his coach Jim O’Donnell of Bondi. This new approach and his dedication to training were paying off. 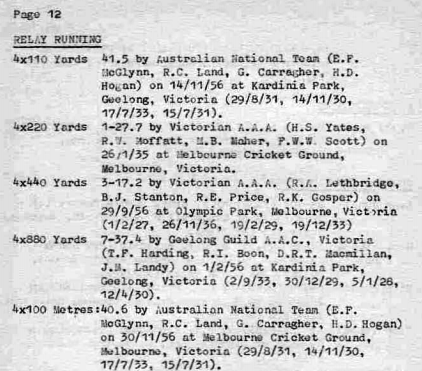 In December 20, 1952 on the cinders track at ES Marks Field, McGlynn won the 100 yards in a time of 10.2 while running into a strong wind. 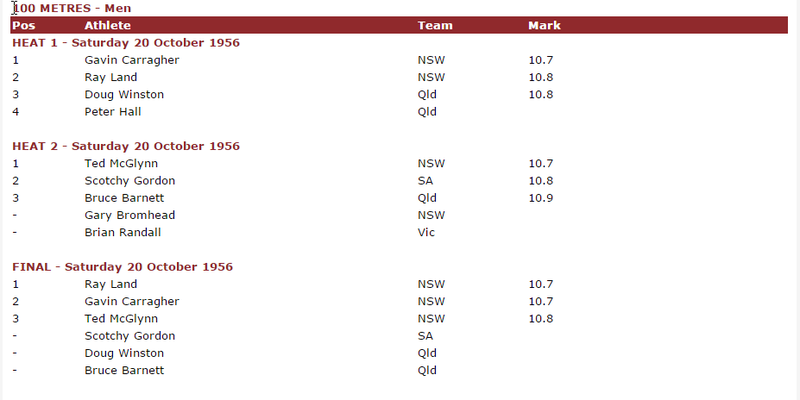 In becoming sprint champion, McGlynn had beaten experienced Olympians such as John Treloar and Edwin Carr. Other top class sprinters that were left chasing McGlynn’s shadow were Bob Solomon and Kevin Reede. 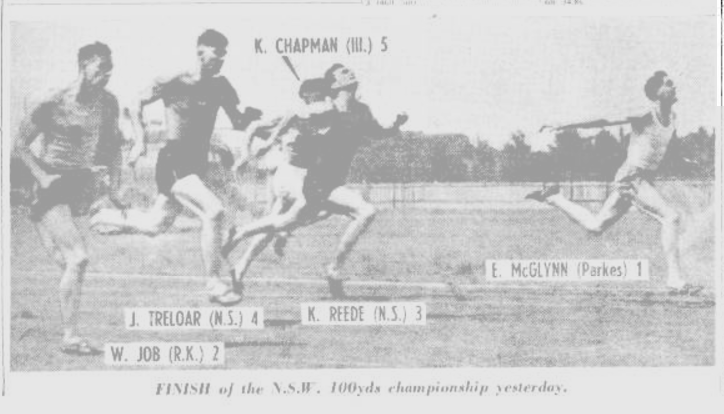 On January 3, 1953, McGlynn won the NSW open 100 yards title in a wind assisted 9.6 seconds beating Bill Job, who in November had set an Australian 100m record of 10.5. Kevin Reede was third and Helsinki Olympian John Treloar fourth. Treloar had never previously finished lower than second in a domestic race. Some veteran officials described the race as the best they had seen since Jim Carlton’s day. McGlynn was described as having an ungainly arm action. 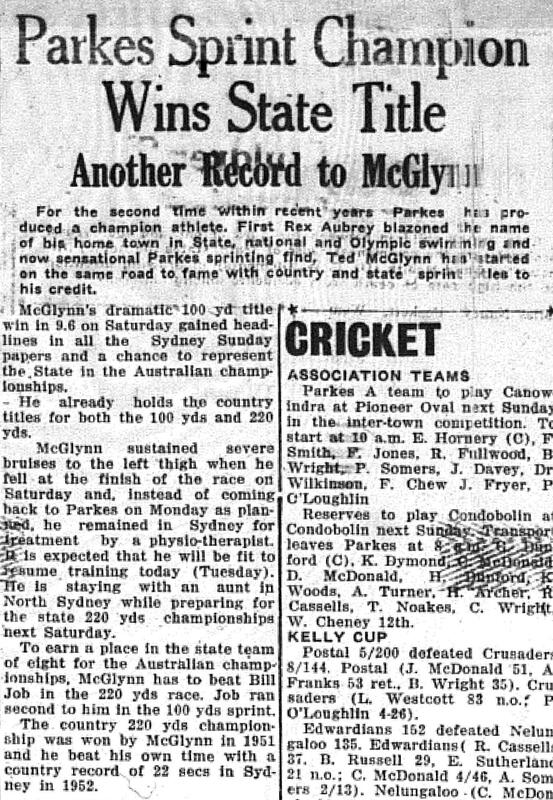 After the race, McGlynn was due to return home to Parkes, but decided to take a week’s leave and prepare for the 220yd the following Saturday. 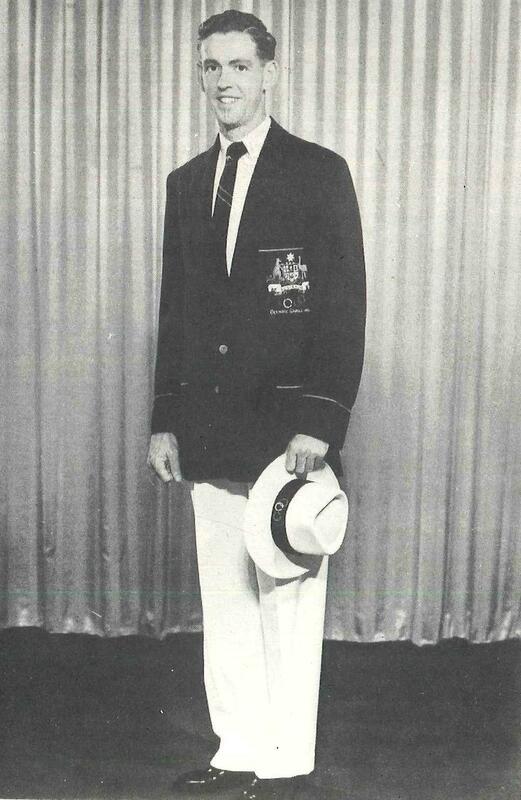 “Jim O’Donnell was unable to travel to Parkes so I stayed in Sydney to get proper coaching. I have not done any training for the 220 yard event,” McGlynn said at the time. “However I will make a strong bid to win the double.” McGlynn was also recovering from grazing and bruising he received after falling at the end of the 100 yds final. McGlynn did not make the Commonwealth games for either individual or relay events. The announcement of the Empire Games Australian 4 x 110 yard relay team was greeted with controversy, with Hec Hogan the only specialist 100 yard sprinter chosen. The other three relay members were Brian Oliver (whose speciality was long jump), David Lean (400 metre hurdles and 4 x 400 metre relays) and Kevan Gosper (400 metres). Australia achieved bronze. 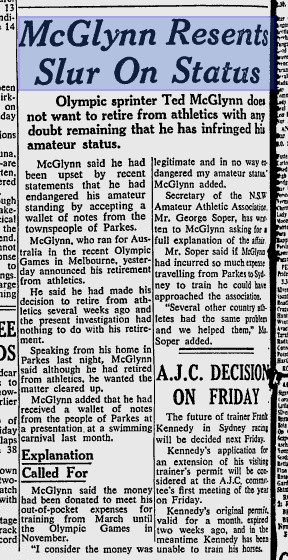 In 1956 McGlynn travelled to Sydney to be a spectator at the State Championships. He was encouraged to make a come back for the Olympics. McGlynn discussed this with his future wife, Patsy. Patsy was a Forbes resident whom Ted had met at a youth group in Forbes in December 1952. With her encouragement, Ted decided to give it his all and knew it would require extra dedication and commitment. McGlynn suffered one more injury six weeks before the Olympic trials. However he overcame this injury to finish fourth in the 100m and confirmed his Olympic selection. With injury behind him, McGlynn’s form in the lead up was impressive finishing first in the 100 yards on November 3 – beating future Olympian, Jamaican Keith Gardner – and being part of the Australian 4 x 110 yards relay team who set a new national record on November 14. In further proof was needed that sport was viewed vastly differently in 1956 than today, the next episode in Ted McGlynn’s career provides it. Naturally Parkes Shire wanted to celebrate the achievements of an athlete who had competed at the highest level. Many knew that he was travelling regularly to Sydney and taking time off work to try and reach peak performance levels. Athletes had to pay their own way to state and national championships as well as the Olympics. Endorsement deals were not allowed, athletes had to provide their own racing kit and footwear. Mayor Alderman A C Moon had organised a celebration after a swimming carnival on Sunday January 6 1957. McGlynn was presented with a wallet filled with notes donated by the residents of the Parkes Shire. However this caused controversy in the administration of Australian Athletics who believed McGlynn should no longer be considered an amateur. This would mean that should McGlynn compete in any exhibition races, he would be endangering the amateur status of athletes running against him. This led to a disappointing conclusion to McGlynn’s athletics career and one that is unheard of nowadays. However McGlynn did not let it diminish his love for athletics, maintaining involvement in coaching and attending Olympians anniversary functions. 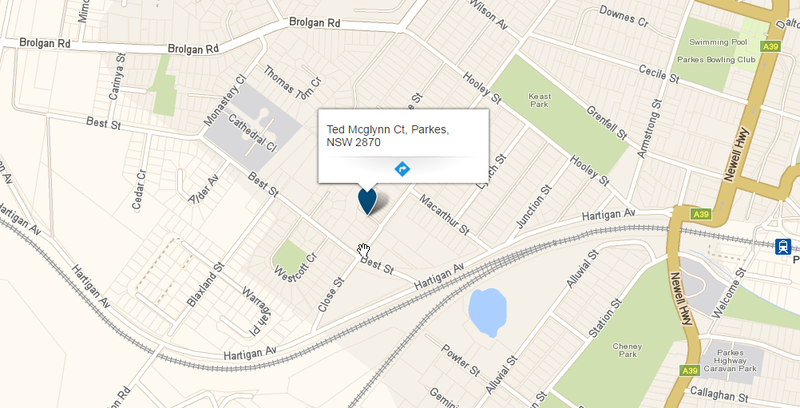 If you have stories or memories that you are willing to share about Ted McGlynn or any of the other Olympians of the Parkes Shire , please contact Parkes Shire Library via library@parkes.nsw.gov.au so that they can be shared and kept for posterity on this blog. Alternatively you may leave comments on this page. Thank you, Greg. We appreciate your feedback and hope you enjoyed reading it as much as we did researching and putting it together. All the best. 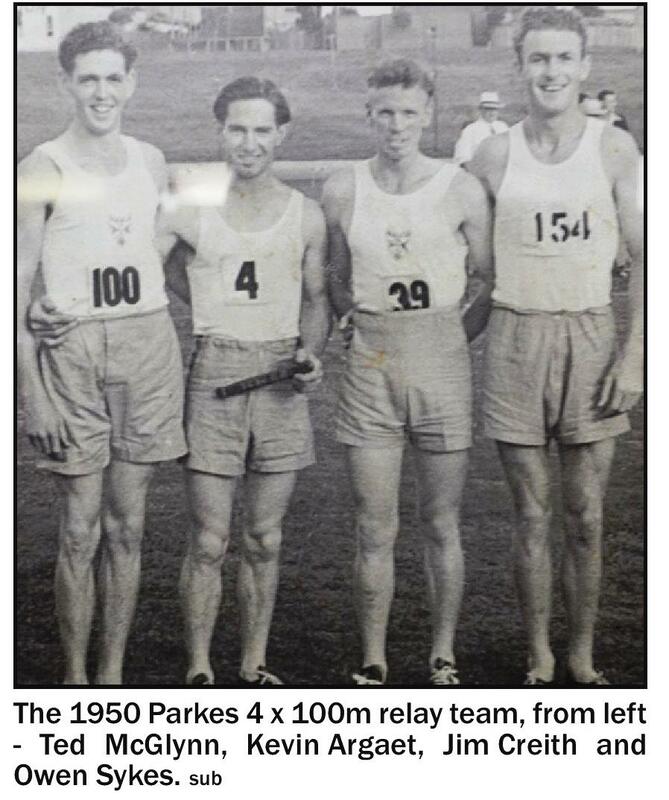 This entry was posted on July 4, 2016 by parkeslibrary in 1950s, 2000s, all-round sportsperson, comeback, controversy, famous people of Parkes Shire, General history, local historical articles, Olympians of the Parkes Shire, Olympic Games, Parkes, tragedy, Uncategorized and tagged 100 metres, 100 yards, 1956 Olympic Games, 4 x 100 metres relay, 4 x 100 yards relay, 40.6 seconds, 41.5 seconds, 9.7 seconds, Amateur Athletic Union of Australia, amateur status, athletics, Bill Job, Bob Solomon, Bobby Morrow, boxing, controversy, Country Championships, Cowra, cricket, Dot McGlynn, E S Marks Field, Edwin Carr, Esquire Mercers, famous people of Parkes Shire, Farmers Depot, football, Gavin Carragher, Golden Fleece Oils & Grease, golf, Harry Arnall, Hec Hogan, Henson Park, history, hockey, Holy Family Primary School, Jim Creith, Jim O'Donnell, John Treloar, Keith Gardner, Kevin Argaet, Kevin Reede, local reaction, Marist Brothers Forbes, Mayor Alderman A C Moon, McGirr's, McGlynn & McGlynn Accounting, Melbourne Olympic Games, Melbourne Olympics, Mums Custard Powder, National Championships, national record, National Title, NSW Athletics, Olympians of Parkes Shire, Owen Sykes, Parkes, Parkes Athletics Club, Parkes Champion Post, Parkes District Cricket, Parkes Municipal Council, Parkes Shire, Parkes Shire Council, Patsy McGlynn, professional athlete, Ray Land, Rex Aubrey, Rex Aubrey Place, smiling sprinter, Sports Resources, Stansfield Garage, State Title, Stephen Davies, Sunday Herald, Sydney Morning Herald, Ted McGlynn, Ted McGlynn Court Parkes, tennis, Triumph Mayflower.